Klipsch reintroduces Forte III as part of its Heritage series | What Hi-Fi? 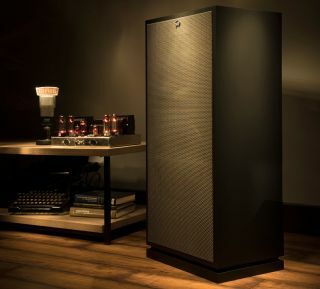 The Forte III is a Klipsch speaker in the grand manner. And for its original 11-year production run, it was of Klipsch's best-selling models. Now, after a 21-year hiatus, Forte III is back. The broad design hasn't changed, although the new speaker does - of course - reflect some of the changes in technology and engineering that have occured in the last couple of decades. Forte III is a three-way design, featuring a 12in woofer and horn-loaded midrange and tweeter with titanium compression drivers. The midrange includes a modified Tractrix design, and there's a rear-mounted 15in passive radiator for additional bass presence and extension. Klipsch say the cabinet is "just" 13in deep - which, to be fair, is modest in an old-school design like this. Forte III is on sale now in the United States at a price of $1800 per speaker. Finishes include natural cherry, American walnut, black ash and something called distressed oak. Or you could pay $2000 for matt black with silver grille, or $2300 for California black walnut with lambswool grille. Decision, decisions.